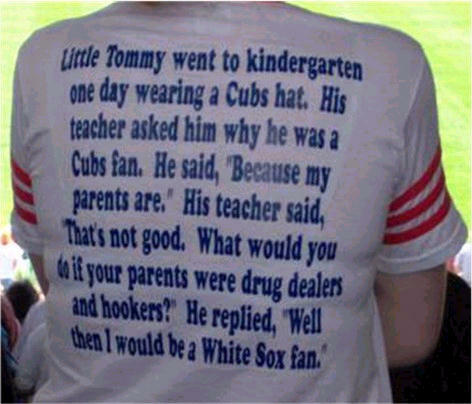 lol, thats an cool shirt. yeah, I think I’m going to have to make a similar one for my daughter. my mother-in-law is a Braves fan and I’m a Yankees fan. that crazy lady is always trying to give some lousy Atlanta crap to my daughter. This is funny because it’s true. I get to sit in the Wrigley bleachers this weekend against the Cardinals, so I’m a happy fan.